The unanswered question is, "just how vast are these ranges of transmit power levels?" Can a smartphone or tablet go as low as half power? 10% power? 0.0001% power? 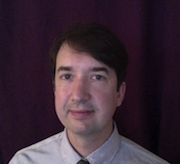 Those differences could have a major effect on a WLAN infrastructure's ability to handle a variety of devices. I decided to do a quick, unscientific test of device transmit power levels while on a non WiFi-equipped plane. 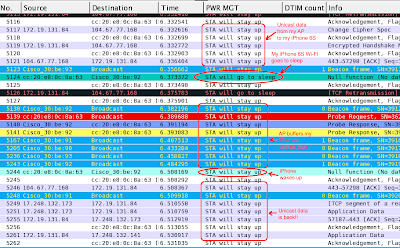 I sat the device directly adjacent to my 2012 MacBook Air (which has a 2-stream 802.11a/b/g/n WiFi radio) running in monitor mode. 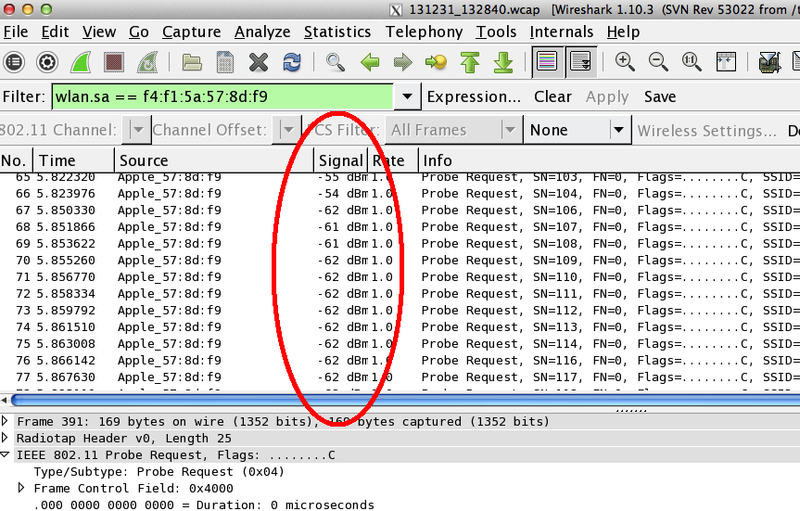 Then I let the device send Probe Request frames looking for nearby WiFi networks. I used the received signal strength in those Probe Request messages to see if my WiFi devices were changing power levels. 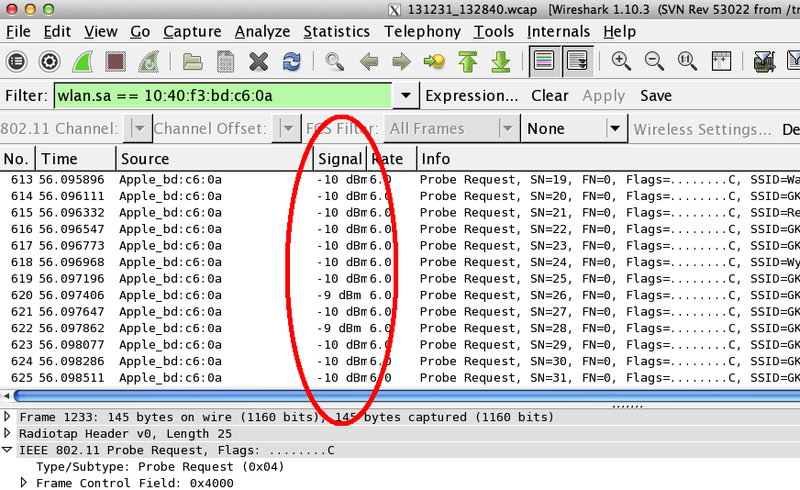 The screenshot above shows that my MacBook Air's WiFi adapter was receiving Probe Request frames at a signal strength just below -20 dBm. 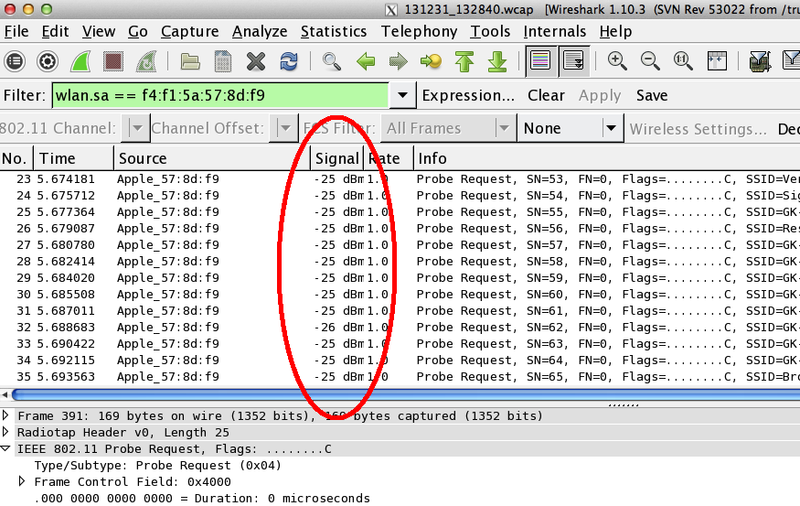 Notice how the received signal strength is now about 10 dBm higher, hovering around -10 dBm. That means that my iPad sort of got frustrated with having no AP to associate with, and decided to start using a higher transmit power in the hopes of reaching an AP that is further away. This behavior is bad for battery life, but would seem to indicate that a 3rd generation iPad can handle connecting to an AP that uses a very high transmit power. After looking at the iPad, I moved on to my iPhone 5. 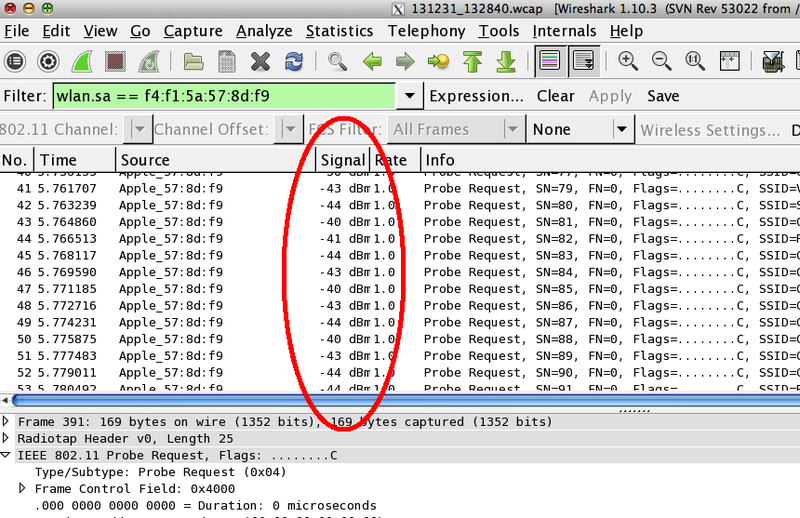 My iPhone 5 has a 1 stream 802.11a/b/g/n radio, just like the 3rd gen iPad does. The received signal strength from the iPhone 5 is maybe a few dB lower than the received signal from the iPad, but it's close. 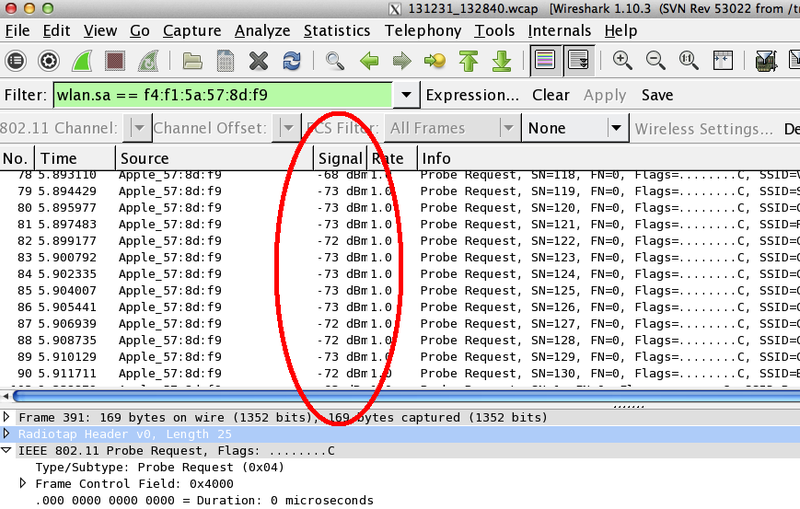 The iPhone started using a LOWER transmit power when sending Probe Request frames. Could this be? Is it possible that iPhones actually lower their transmit power when probing? In some ways that would be good. It would mean less interference in large venues like hockey arenas when users fail to connect to guest WiFi. But in the enterprise it could be bad. It could result in frustrated users. 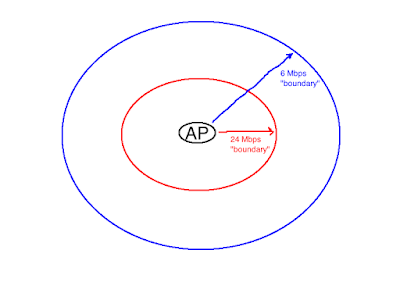 A user might be told by support personnel that the WiFi is up and running, but the extremely low transmit power used when doing active scanning (that's the 802.11 term to sending Probe Request frames in hopes of receiving a Probe Response) could cause the iPhone to think that no APs are nearby. This was an unscientific test, so there could be other reason for these odd results. 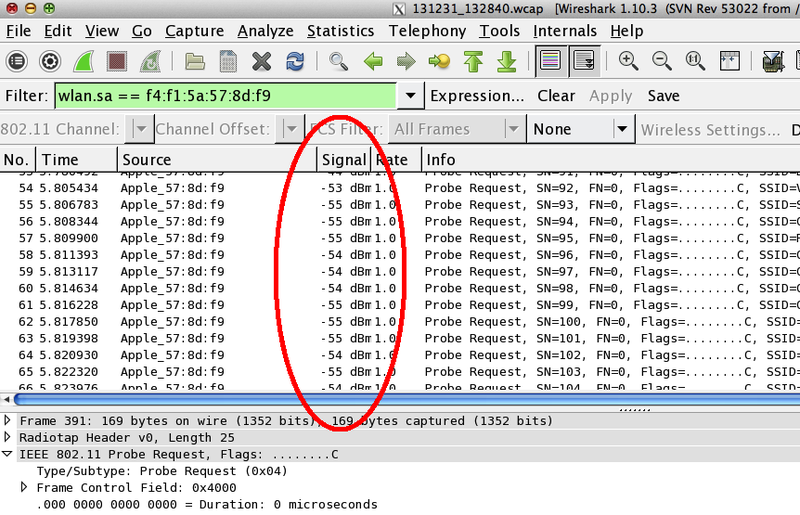 Maybe the iPhone 5 was probing on channel 4 while my laptop was capturing on channel 1. Maybe the signal strength just appeared to be lower because the channels were off. Maybe iPhones have different transmit power levels for data and management (which includes Probe Requests/Responses) frames. Maybe it's a temporary bug in Apple's iPhone code that will eventually be changed. Whatever the reason for the odd changing of transmit power, it is something to take note of if you support iPhones. 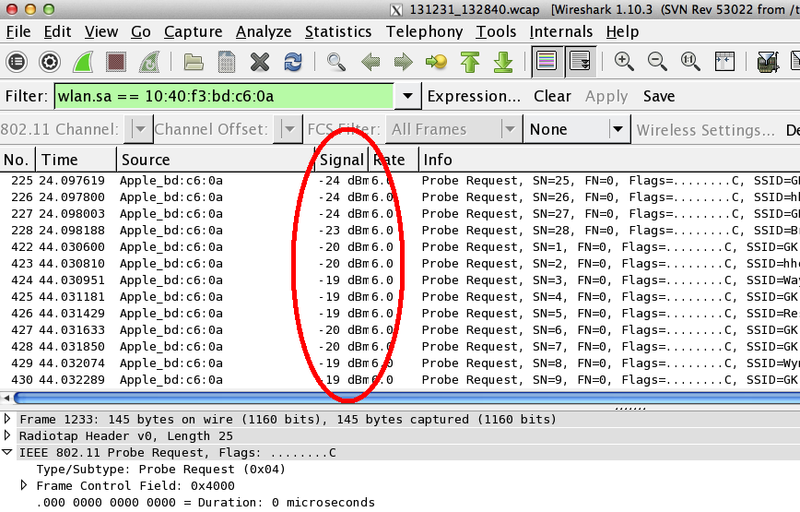 And it's yet another reason that sniffing WiFi often reveals information that is unavailable from vendor documentation. You wonder what type of effect this variability, most likely across vendors (or vendors selected Wi-Fi chipset vendors) would have on passive location based services?